Descripción "Targeting the source text. a coursebook in english for translator trainees (teacher's guide) (universitas)"
BREHM CRIPPS, J. TARGETING THE SOURCE TEXT. 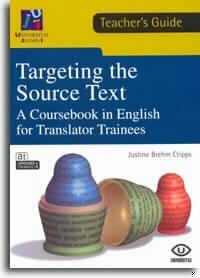 A COURSEBOOK IN ENGLISH FOR TRANSLATOR TRAINEES. TEACHER'S GUIDE. CASTELLON, 2004, 135 p.,. Encuadernacion original. Nuevo.